When the Xbox One launched, Microsoft tried to get clever and provide people with a pre-written sick note so they could take the day off. It wasn't very funny, but it was harmless. 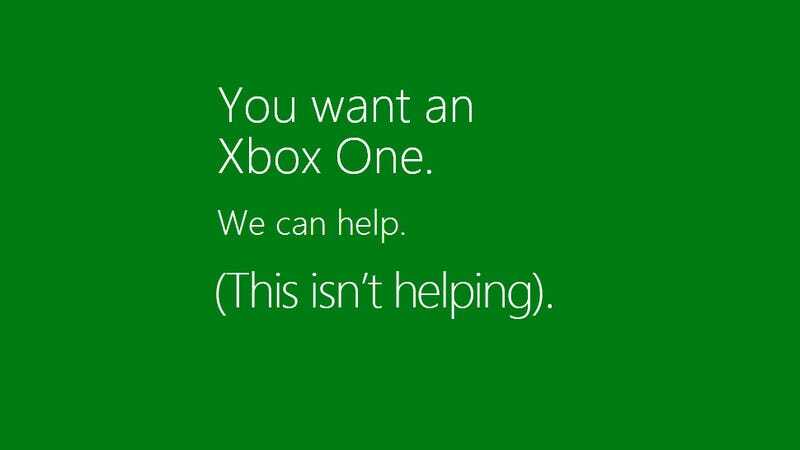 Their next attempt at an Xbox One letter is a touch worse. Called "We got your back", it's aimed at prospective new owners of the console, and their partners. Not sure if you've heard, but Xbox One is now available. That means we can start playing games like Dead Rising 3. I know, I know. You'd rather do your taxes early than watch me slay zombies, but hear me out on this. Xbox One is actually for both of us. Seriously. Games! Maybe you don't LOVE games like I do, but there's really something for everyone. While I'm playing Dead Rising 3, you might like arcade games. And since you were just begging me to dance, I'm willing to play Forza Motorsport 5 just for you. It's a win-win! Entertainment for both of us. You love movies and I love football. Well, with the Xbox One, we can love both. We can catch your favorite team AND check out my favorite team. Just think of all this togetherness we're going to experience. It's gonna be awesome! It will help us get fit. The console offers Xbox Fitness free with Xbox Live Gold through December 2014* so I can get the abs I've always dreamed of, while working out to Tracy Anderson. Play with others. You've been encouraging me to play with others and it just so happens that Xbox One has the best multiplayer service that filters out jerks. So don't you worry. If we get an Xbox One, I'll bemaking new friends in no time. We can talk on Skype with your favorite sister whom, of course, I love dearly. Heck, we can even talk to them while we watch your favorite TV show. So what do you say? Let's be like an awesome movie montage—just me, you, and my our Xbox One—together at last. p.s. Did I mention how beautiful you are? And how I really appreciate that you love me more than anything ? p.p.s If (or should I say when) we get Xbox One, you have dibs on the first multiplayer game that we experience together. p.p.p.s Long story short: I really, really, really want one for the holidays—y'know... for us. In its defence, Microsoft told Eurogamer that while "The letter is fully customisable," (you can alter certain terms, like changing "movies" to "music"), the company "[understands] how the defaults could be perceived. We're making changes to the letter defaults and apologise for the oversight." It's kind of strange that nowhere along the approvals process for this did somebody look at those default options available say, hey, maybe this is coming across as pandering to an old stereotype of dudes with nagging girlfriends/wives who hate games? And maybe we should make the first options that show up a little less condescending? Like I said though, the more you play with those drop-down terms the more you can change its tone and meaning, so it won't take much work on Microsoft's part to fix this. UPDATE - OK, it's been changed. There are now no default options displayed. For reference as to how easy it was to change things, and how different the thing could have been with just a little work, here's a letter I made using some of the...other choices. It no longer comes across as condescending. It just comes across a little...strange. Not sure if you've heard, but Xbox One is now available. That means we can start playing games like LocoCycle. I know, I know. You'd rather eat the skin of 12-day-old pudding than watch me get sweaty, but hear me out on this. Xbox One is actually for both of us. Seriously. Games! Maybe you don't LOVE games like I do, but there's really something for everyone. While I'm playing Skylanders SWAP Force, you might like old school classic games. And since you were just begging me to shoot hoops, I'm willing to play Assassin's Creed IV: Black Flag just for you. It's a win-win! Entertainment for both of us. You love football and I love football. Well, with the Xbox One, we can love both. We can catch your favorite team AND check out my favorite team. Just think of all this togetherness we're going to experience. It's gonna be awesome! It will help us get fit. The console offers Xbox Fitness free with Xbox Live Gold through December 2014* so you can get the stunning pectorals I've always dreamed of, while working out to Tracy Anderson. Play with others. You've been encouraging me to meet people from other cultures and it just so happens that Xbox One has the best multiplayer service that doesn't make me wait in lobbies. So don't you worry. If we get an Xbox One, I'll be spending less time in the bathroom in no time. We can talk on Skype with your creepy uncle whom, of course, I love dearly. Heck, we can even talk to them while we watch your favorite sporting event. p.s. Did I mention how handsome you are? And how I really appreciate that you sing me to sleep? p.p.s If (or should I say when) we get Xbox One, you have dibs on the first Skype call that we experience together.